The South Downs Way is a 100 mile National Trail running from the ancient capital of England at Winchester, to Eastbourne on the south coast. I had walked the trail over a number of weekends back in the nineties with our local Ramblers group but this trip was in a westerly direction and I felt at the time that it would be better walked in an easterly direction, towards the sea, rather than away from it. Also, the best scenery on the trail is in the eastern half of the trail so it made sense to me that it should be walked in this direction. 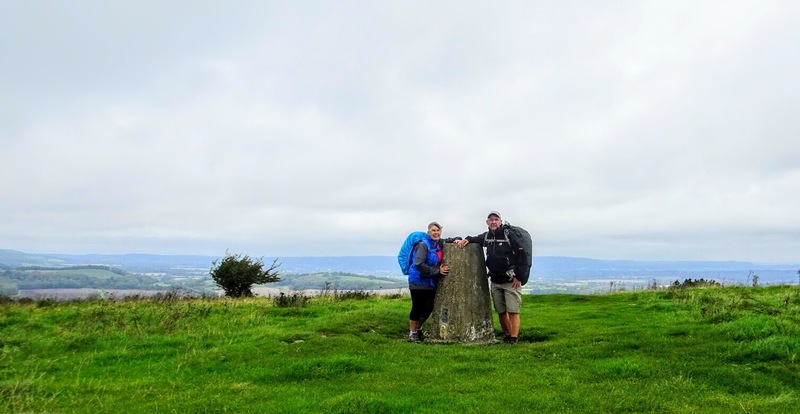 I also wanted to do it as a continuous walk, rather than in sections so as we were visiting the UK, we took the opportunity to take on the trail over eight days, staying in pubs and hotels along the way. The following is a photo diary of the trip between 18th and 26th September 2017. We travelled from London to Winchester by train on the 18th and spent time looking around Winchester cathedral and the Great Hall before checking into our first pub, the King Alfred. Winchester was as beautiful and interesting as I remember from my first trip along the way and it was good to have time to look around before setting off the following day. Our first day saw us hiking from Winchester to Meonstoke, near Exton. The walking was quite easy and the scenery was okay, if not spectacular. We enjoyed good weather and on reaching Exton, left the SDW for the short walk to Meonstoke where we were booked into the Bucks Head Inn for the night. The second day started badly. Being a National Trail, the SDW is superbly waymarked. Well mostly! This had led me to become lazy on the first day and instead of regularly consulting the map and guidebook, as I would normally do, I simply followed the signs. This 'nannying' led me into two big errors along the way, the first of which occurred just outside Exton. We left the pub in Meonstoke and walked back the short distance to the trail looking for a railway line that the landlady said we would be following for a distance. Soon, we found the disused trackbed and followed it for around a mile, arriving at a main road by a pub with no sign of the SDW. Consulting the map and guidebook, I realised we had set off in the wrong direction along the trackbed and upon returning to the point where we had made the erroneous turn, discovered that a wooden fingerpost had been broken off. We had now been walking for over an hour and were almost back where we started! This made the day seem quite long and by the time we reached our overnight halt at Buriton, we were ready for a a beer and some food! The highlights of the day were the views from Old Winchester Hill and Butser Hill. Back on track, at last! The weather as we set off from Buriton to Cocking didn't look promising but although at one point, while resting on Harting Down, it began to rain a little, we never really needed the waterproofs that we had donned while having our break and eventually took them off as we became too warm. We arrived on the summit of Beacon Hill and took a selfie using the conveniently sited topograph to rest the camera on. For me, this was the best day for scenery so far as the way was now taking on a more airy, elevated feel. Eventually, we left the SDW and navigated downhill to our accommodation at the Blubell Inn at Cocking and arrived just as the heavens opened in earnest and we sat in the bar enjoying a drink watching as the rain ran down the the pub windows. The following day started clear and bright with beautiful, blue skies and we climbed back onto the downs looking forward to a day walking in the superb conditions. We were heading for Amberley, where we had been unable to obtain accommodation, so the plan was to get a train the short distance from Amberley to Arundel, where we had secured a room in an hotel close to the railway station. The SDW ran past Amberley station, so for the first time since we had set off from Winchester, we didn't actually have to walk off of the way. The SDW, after the initial climb from Cocking, passed through woods so views were a little restricted, but eventually, these petered out and we again had superb views all around, the best so far, as the hazy outline of the downs escarpment stretched into the distance ahead of us. On reaching Amberley Station, we had a half hour wait for the train before the short ride to Arundel and having checked into our hotel, strolled into the town for a cursory glance around the outside of the castle but unfortunately, we were too late to go in for a look around as it was due to close. In hindsight, we regretted not having planned a rest day in Arundel to give us time to look round the beautiful, quaint town with it's imposing castle. The following morning, having returned to Amberley, we climbed back onto the way as we headed for Upper Beeding. This was to be a long day at around 15 miles but once on the tops, the walking was easy and mostly level, with only the climb onto the old hill fort of Chanctonbury Ring providing any difficulty. As a consequence, our pace was quite fast and it didn't take us too long to reach Washington, from where we climbed up onto Chanctonbury Ring. This hilltop earthwork is visible for some distance because the summit is ringed with a number of beech and sycamore trees. We planned to take a break here as the surrounding views are quite spectacular but in the event we didn't stay long as there was a cold wind blowing that we seemed unable to find shelter from, so after a brief stop for food and drink, continued on our way. Later, having descended to Botolphs, we left the SDW for the Downs Link, which we followed into Upper Beeding before locating the Rising Sun pub, where we had a room booked for the night. We left Upper Beeding for Lewes following the now familiar pattern of climbing steeply back onto the downs. This is something to be aware of when walking the SDW as the route mostly follows the very top of the downs requiring a descent at the end of the day to obtain accommodation and a subsequent ascent at the beginning of the day to regain the tops. At around 16 miles, this was to be the longest day of the trip but also turned out to be the most tiring as, whereas the previous day had been mostly level, today's walk was punctuated by numerous short, sharp climbs. The weather was again very pleasant with sunshine and clear skies, although these were now accompanied by a fairly blustery wind. The other change was that being Sunday, the hills were alive with people! We shared the path for most of the day with walkers, runners, cyclists and horse riders! It seemed like most of the south of England was on the SDW for the day. We arrived in Lewes feeling quite weary after a seven hour walk and having located and checked into the White Hart Hotel, were not too amused to be told that 'as it was Sunday', they were not serving food that evening meaning that we had to go out to find somewhere to eat. All very odd! The following morning, we awoke to rain although fortunately, by the time we left Lewes, it had stopped. We had decided that we were not about to walk the three miles back uphill that we had descended the previous evening into the town, as this would have entailed a long walk in a reverse direction, so we set off along the River Ouse to Southease in drizzly rain following the riverbank. On reaching Southease, we rejoined the way and climbed in fairly misty conditions back onto the downs. Once we had climbed Itford Hill, we had a fairly straightforward walk to Firle Beacon and Bostal Hill and, although it didn't rain, the views to Newhaven and into the Weald were fairly restricted by the conditions. We descended comfortably to the charming village of Alfriston and checked into the Olde Smugglers Inne, where we spent a pleasant afternoon and evening preparing for our final day of the trip. We left Alfriston on our final day following the SDW signposts as we had done since leaving Winchester. There are two finales on the route, one inland following the tops of the downs and one to the Seven Sisters Country Park in the Cuckmere Valley by the coast. From there, it is a roller-coaster ride across the chalk cliffs to Eastbourne and the end of the walk, this is the route we planned to take. I still don't know how I managed it, but having spent a week being 'nannied' by the SDW signposting, I somehow missed the turn for the coast and following the signposts, we found ourselves up on the downs. Neither of us recall seeing a signpost highlighting the split in the two routes and we simply followed the obvious SDW signs. It was as we climbed higher that alarm bells began ringing with me as I suddenly realised that we shouldn't be on the tops of the downs but in a valley. I consulted the map and decided to abandon the 'alternative' inland finish across the top of the downs and navigated our way through Friston Forest to the village of Friston, from where we took a path leading to Birling Gap and the SDW. I was a little annoyed with myself for not paying attention for the second time on the trip but in the end, it didn't really detract from the day. We had lunch in the cafe at Birling Gap and set off along the cliffs with a party of around 150 German schoolchildren. Deciding that these were far too noisy for our liking, we sat for a while to let them pass by and set off again for the Belle Tout lighthouse and Beachy Head. The day had started in fog but this had now lifted and left a day of hazy sunshine. The final section was indeed as spectacular as we remembered and we paused many times for photographs and to just absorb the final moments of this magnificent trail. Soon, we were descending into Eastbourne and taking our photo by the information board at the eastern terminus. We still had a mile and half to go along the seafront to our hotel but we took this at a leisurely pace, to enjoy the final few moments of a memorable trip.